The European Commission has developed a fire test requirement for electric cables, for use in conjunction with the Construction Products Directive (CPD) throughout Europe. The test is based on the traditional IEC 60332-3 test vertical cable tray test, with heat and smoke release measurement instrumentation, and is contained within prEN 50399-2, as originally developed by the FIPEC project. The same instrumentation is also used in the United States and Canada, and contained within UL 1685, ASTM D 5424 and ASTM D 5537, and in Canada, in CSA FT4. UL 1685 and CS FT4 are used in the respective North American electrical codes (NEC and CEC). The European test was developed as part of the 3 year European FIPEC (Fire Performance of Electric Cables) project, carried out by 4 laboratories: SP (Sweden), ISSeP (Belgium), CESI (Italy) and Interscience (UK). FTT director Stephen Grayson managed the project and FTT’s Andrew Green was key in conducting instrument commissioning, software and data base development and maintenance. Heat release rate is assessed by continuous measurement of the oxygen being consumed during burning. 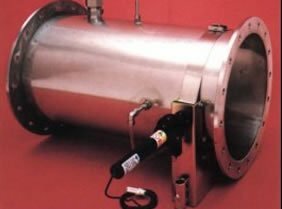 Combustion products are sampled from the exhaust duct of the fire test apparatus and used to determine the level of oxygen depletion. Additional measurements are made of mass flow rates and smoke temperatures, so as to calculate heat release rate. 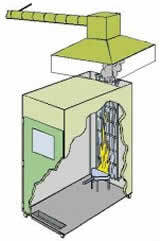 Smoke release rate is similarly calculated from optical measurements and mass flow in the duct. Other combustion products (carbon oxides, soot, etc) can also be conveniently measured in the same process by using appropriate analyzers. Conversion of existing vertical cable tray rigs for IEC 60332-3, UL 1581 and CSA FT4 are conveniently done by fitting a small instrumented duct section into the exhaust system. The section houses all the gas sampling, temperature and mass flow probes, and the smoke measuring system. 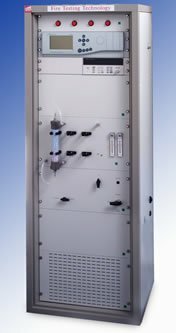 Gas analysis instrumentation is housed in a 19″ rack that can be placed near the rig or in an adjacent laboratory, office or control room along with the data acquisition equipment. The FTT supplied instrument rack and the data acquisition computer and software can also be used to fulfil the same function in the small-scale cone calorimeter (which FTT provides as a dual cone). Thus customers with the FTT conversion from IEC 60332-3 or UL 1581 to prEN 50399-2 can readily extend their instrumentation, at minimal cost, to undertake cone calorimeter studies. The rack can also be used for instrumenting all other large scale calorimeters, including the various room corner test (NFPA 286/NFPA 265/UL 1715/ISO 9705), tests for upholstered furniture and mattresses, the SBI and various furniture calorimeter tests.